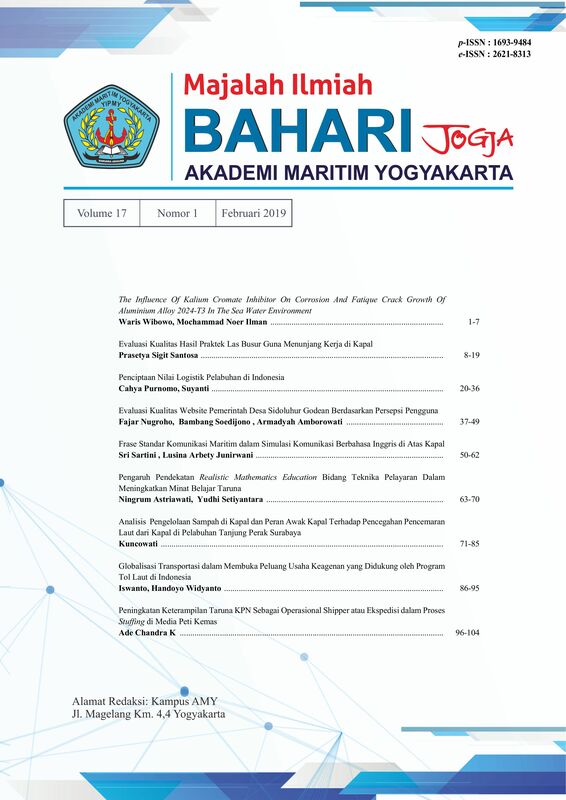 Research on cadets practicing objects is generally done visually, including the results of the practice of cadet welding at the Yogyakarta Maritime Academy, because the method is considered the most practical, but the method has not been able to reveal the quality of the results of the practice, especially related to mechanical properties and metal deposit. In connection with this, this study is to determine the quality of the results of the practice of arc welding, by doing tensile testing and macro testing. This research is a descriptive study with a research population of 40 objects from the practice of cadet arc welding, and a research sample of 50% of the population. Graduation of tensile testing, determined by comparing the tensile stress data. Minimum basic materials and welding materials. While the graduation of the macro test is determined by the presence or absence of defects in the metal deposit. The number of graduations from the two tests is published. In this study cadets can do the welding I connection with the results of fulfilling the graduation test requirement of 12 cadets or (60%), while cadets who can do welding I and T connections with the results of fulfilling the macro test graduation requirements, are as many as I connections 16 pieces (70%), while the T connection is 65%. Groendjijk, G and Vanderline,J. (1980). Material Beproeving, Alih bahasa Oleh Soebandi, S. Pengujian Materi , Jakarta: Bina Cipta, 1984. Smith. F. (1981). Basic Fabrication and Welding Engineering, Hinggong : Wing Tai Cheung Printing co.l.t.d. Sri Widharto. (1997). Petunjuk Kerja Las, Jakarta: PT. Pradnya Paramita.